We have to thank Alan Ehrgott, the director of the American River Conservancy (ARC), for bringing this trail to reality. Since 1989 Alan worked writing grant applications, finding easements, negotiating with property owners, hosting fundraisers, and finally organizing the trail and bridge construction. 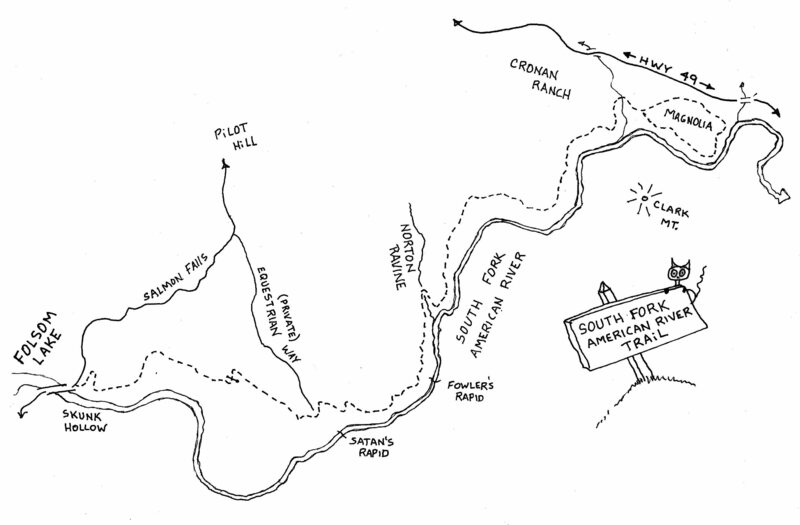 His dream to have a trail connecting Sutter’s Mill, in Gold Discovery State Park, to Sutter’s Fort in Sacramento is mostly complete with the trail dedication in Oct. 2010. We are grateful for the efforts of so many people working with and for ARC, for such a job well done. This trail provides a vital link for non-motorized travel along the South Fork of the American River from the Coloma area to the Folsom Lake Recreation Area trails at Salmon Falls. From these trails you can go all the way to Old Sacramento! The last 2 miles before Salmon Falls is currently closed to horses to protect rare plants that inhabit what is known as the Pine Hill Plant Community. Plans are on-going to find an alternate trail route for equestrians. Access to the S.F. Trail is at 4 current locations. Closest to Coloma you have the first at Greenwood Creek, a half mile farther Magnolia Ranch then Cronan Ranch near Pilot Hill, and finally Skunk Hollow at Salmon Falls bridge($). You can park for free on the far (west) side of the bridge if space allows. 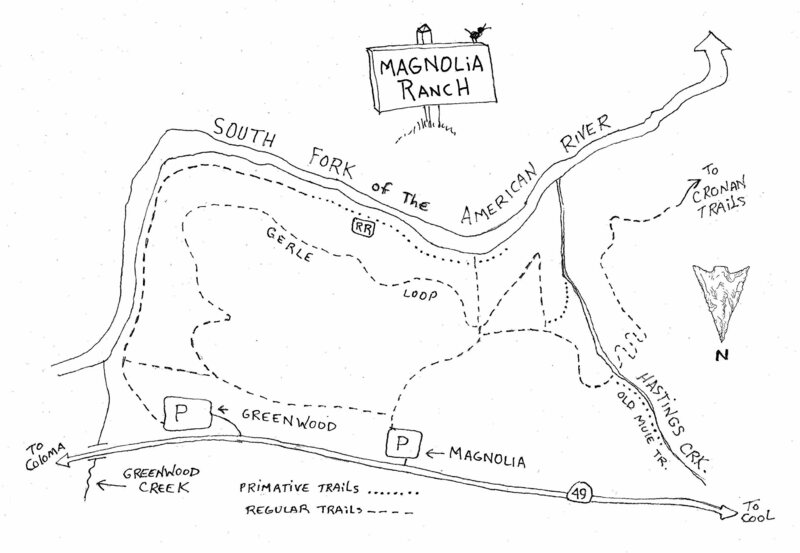 See Cronan and Magnolia maps for the entire route of the trail. 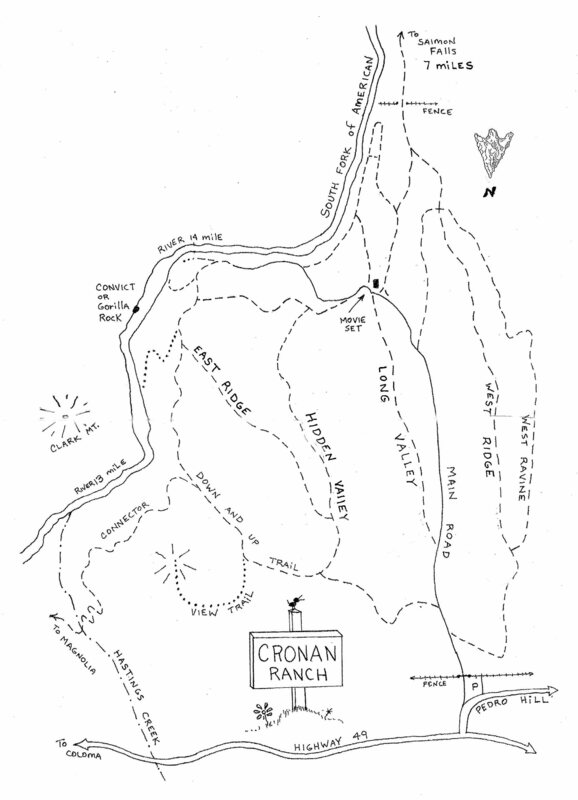 The trail between Cronan Ranch and Salmon Falls is very exposed to the sun with little shade and even less water, during the hot season be prepared to tan.